WORTHINGTON — Members of the Worthington Town Council believe their police officers should be required to wear bulletproof body armor when on duty. Right now, it’s optional for officers to wear the bulletproof body armor, but the department does buy them. Tuesday night, the town council discussed the issue and promised it would emerge again at a future meeting. “I think with all of the recent problems that we’ve had around the nation, and right here in Indianapolis, I think you guys as part of the SOP (Standard Operating Procedures) that everybody should wear them while they are on duty all of the time,” council president Gregg Roudebush said speaking to Town Marshal Dennis Conaway. What is bulletproof body armor? Bulletproof body armor is a protective garment which is designed to protect the wearer from the impact of bullets and shrapnel. Unlike body armor, which is made from hard plates, bulletproof body armor are made from soft materials and they are designed to be lightweight, flexible, and comfortable. 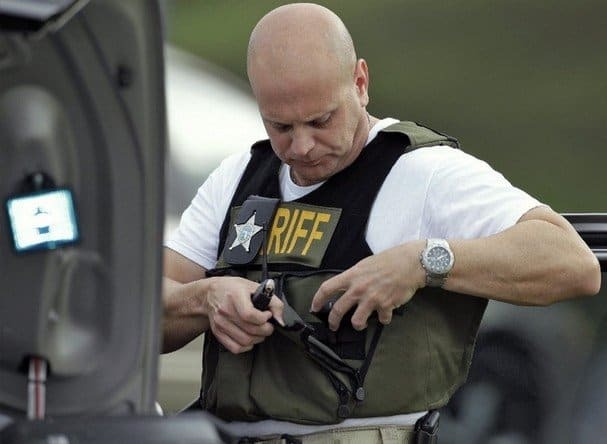 Many in the field of law enforcement wear bulletproof body armor on the job to protect themselves, according to wiseGeek.com. In Indiana, construction workers are required to wear helmets in dangerous situations. By law, everyone is supposed to wear seatbelts on the highway. However, in most departments, law enforcement officers are not required to wear bulletproof vests. “I think it ought to be mandatory that we wear them. I mean in looking at officers being injured or even in an automobile accident, the vest would be life-saving for blunt force trauma. For the expense of the town, for the officer, I think it’s no different than a badge or gun or something that they have to wear or have to have their radio with them. I don’t speak for the rest of the board (the council), but that is my opinion. It not only comes down to officer’s safety, but it comes down to dollars and cents for the town as well,” Roudebush said. Roudebush asked that the issue be placed on the agenda for next month’s meeting to be re-examined. A check with other county law enforcement agencies shows most are wearing the bulletproof vests. Greene County Sheriff’s Department Major Mike Hasler says wearing of protective vests is suggested, but not required. “I think the majority my guys do where body armor,” Hasler said. “They are a lot more comfortable than they use to be. That’s the reason why you see a lot more use. Everybody used to have them, but they were so bulky and they were hot. The technology has been so advanced that they’ve been able to add layers of kevlar only that it’s small and more flexible and more comfortable to wear now. Hasler estimated that more than 90 percent of his department regularly wear a vest when on duty. Linton Police Department Chief Troy Jerrell said there is no set policy, but his department is operating under a general order from the chief that officers are to wear the bulletproofvests. “The law changed a while back that we (the police department) have to buy the vests now, so I said if we are going to buy them, you’re going to wear them. My policy is if they are in uniform, then they need to be wearing their vest. Or they may be working the road or working a case where there may be a chance that they would need their vest,” Jerrell said. Jerrell said a typical vest will cost $500 to $600 each. Bloomfield Town Marshal Ken Tharp said there is no requirement policy on vest use, but added, “We do purchase bulletproof body armor. It’s suggested that you wear them. They are provided for our officers. It’s the same with the Jasonville Police Department.